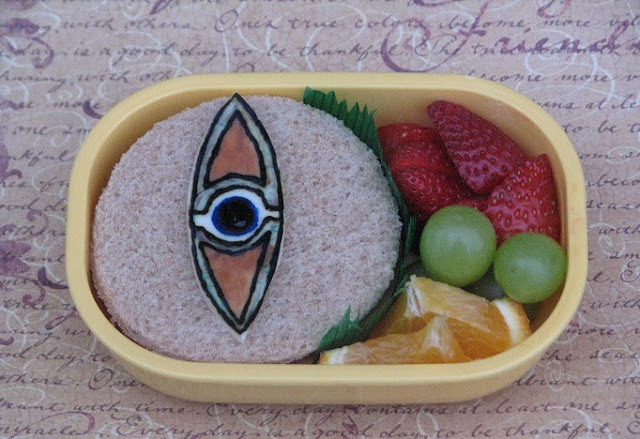 House of Anubis symbol is cheese and food coloring and sits on top of a soy ham sandwich. On the side are strawberries, grapes, and orange slices. Check out more fun noms today at What's for lunch Wednesday? Never watch the show, but your bento looks delish! and I am sure it will make kidlet super happy. You are so good at your cheese/food coloring designs! I may need to try it sometime! Oh, man. I haven't heard anyone reference Hey Dude! or Are You Afraid of the Dark in eons. Staples of my childhood. I'm totally impressed by the (sideways) eye of Horus, too. Looks great! Dramatic and truly cool bento...what an awesome mom you are, Jenn!